Contact center technology plays a major role in the success of your customer experiences and business operations. Having the optimal solutions, infrastructure and provider in place are fundamental to meeting current and future goals and expectations. If you’re struggling with outdated contact center systems that limit channels and customer information, the best path forward is to migrate to a solution that lets you overcome those technology limitations. 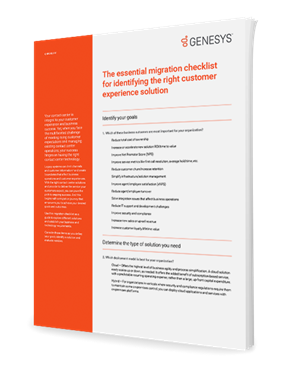 And the first step is to download this comprehensive checklist to evaluate key solutions and vendor considerations.